The story of veteran rock band Queensryche is one of the most amazing stories in the music community today. Having originally formed in 1982, the band has seen the highest of highs and the lowest of lows in the three decades plus since its formation. Those highs include: releasing fourteen albums (or fifteen depending on whether or not one counts Frequency Unknown (which was recorded by Geoff Tate’s Queensryche after his split from his former band mates in 2013) as part of the official Queensryche canon or as its own recording separate from the official Queensryche canon, selling more than twenty million albums worldwide, and earning just as many fans, if not more, in every corner of the world. It has done this largely without the support of mainstream rock radio or even that of MTV and other music networks. The lows mainly are composed of the band’s lineup changes, including the now infamous split between now former front man Geoff Tate and his one-time band mates. Through it all Queensryche has managed to soldier on and remain a relevant and creative force within the rock and music community. Its latest album Condition Human is proof positive of that. The twelve-song, fifty-three minute record contains what is in the eyes (and ears) of this critic to be some of the best material that the band has released in its more than three-decade life. That is thanks both to its musical and lyrical content. The album’s opener ‘Arrow of Time’ is a prime example of that. ‘Just Us,’ which comes much later in the album’s run is another example of just how relevant and creative the band has remained. ‘Guardian,’ with its mix of classic Queensryche sound and socio-political lyrical commentary is one more example of just how relevant and creative Queensryche remains more than thirty years after its original formation. While all three noted songs show in their own way just how important Queensryche remains within the rock and music community in whole, it would be wrong to note only those compositions. The seven songs that remain unnoted here each play their own part in exhibiting the band’s continued relevance and creativity. All things considered Condition Human is an album that shows just how much this veteran rock act still has in the tank. They show in whole to be one more of the year’s best new rock albums. Queensryche’s latest full-length studio recording Condition Human is one more of this year’s best new rock records. Regardless of whether one considers it the band’s fourteenth or fifteenth (thanks to the release of Frequency Unknown by Geoff Tate’s Queensryche in 2013), this album still stands as a tribute to the band’s drive and commitment to making music that it and its fans wil enjoy. They show in whole a band that remains both relevant within the rock and music community and just as creative as ever. Of course it would be impossible to cover every one of the album’s songs in one sitting. Keeping that in mind, this review will focus on just a few of what this critic considers to be prime examples of what makes this album stand out so well beginning with the album’s opener ‘Arrow of Time.’ ‘Arrow of Time’ was a good choice for an opener for this record. That is thanks largely to the song’s classic Queensryche sound in its musical content and its thought-provoking lyrical content. Looking at the song’s musical content, guitarists Michael Wilton and Parker Lundgren’s dual guitar attack creates the band’s trademark classic Queensryche sound. At the same time, there is also an obvious modern touch to the duo’s sound that could actually be considered somewhat hard rock-influenced. It gives the song a nice touch that will take long-time fans back in time while also showing those same listeners just how far the band has come and how it has continued to adapt and change. Front man Todd LaTorre, who took over vocal duties for the band in 2013, adds his own impressive element to the mix with his powerhouse vocal delivery. Those that perhaps have not already had the pleasure of hearing LaTorre’s vocals will be blown away by just how similar LaTorre sounds to former front man Geoff Tate. Audiences that are familiar with both vocalists’ styles could even argue that LaTorre is just as incredible as Tate in his abilities if not better. 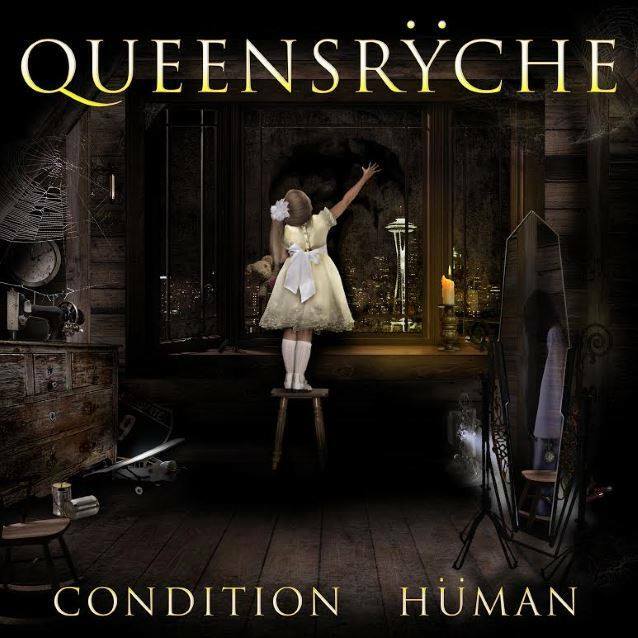 These elements are just one part of what makes this song an example of what makes Condition Human another standout record from Queensryche. The song’s lyrical content is just as important as its musical content in exhibiting this. LaTorre sings in the song, which was co-written by himself, Michael Wilton, and bassist Eddie Jackson, “What will you do/When it’s right upon you/Like a ring of fire/Why ask why/No need to justify/Who really cares anyway/Ethical tragedy/Rabid humanity/Learn from the past they say.” He goes on to sing in the song’s chorus, “Now is the time to make up your mind/And find out what is real/Fight or flight you can’t run/You can’t run from yourself.” LaTorre and company come across as asking listeners, “what are you going to do with those tough situations in life that everyone faces?” There seems to be a bit of sarcasm as he responds in the chorus, “Why ask why/No need to justify/Who really cares anyway/Ethical tragedy/Rabid humanity/Learn from the past they say.” It’s as if the song’s subject is answering the question posed in the song’s lead verse by saying cynically, “Who cares what I do? Look at everything going on. No one has learned their lesson.” This sentiment is echoed in the song’s second verse as LaTorre sings, “One reason to survive/With a thousand ways to die/When you’re living on the wire/Reaching the threshold near system overload/Caught on the red eye again.” This verse sees LaTorre coming across as saying that with so much negativity out there there is so little reason to keep going when one is on the edge thanks to all of the negativity in the world. The song closes with LaTorre singing once more, “You can’t run from yourself.” In other words, we would do well to face ourselves even in those tough situations that seem overwhelming. Trying to escape those problems only causes more problems. This is just the interpretation of this critic. By no means is it to mean that this is the only interpretation. Right or wrong, the lyrical content contained within this song and the song’s musical content together make it a clear example of why Queensryche remains a fan favorite even in its latest new release. ‘Arrow of Time’ proves thanks to its musical and lyrical content to be a good choice for Condition Human’s opener. In the same vein, it also is a prime example of why Queensryche remains just as relevant today as it was in its earliest years. It also serves to show the band’s continued creativity even after so many years. It is just one example of why Queensryche remains so relevant today and a fan favorite, too. ‘Just Us’ is another one of the songs included in this record that shows the band’s continued relevance and creativity. Unlike ‘Arrow of Time,’ this song is much softer but just as powerful through its musical content. The same can be said of the song’s lyrical content. It gives the song its own depth. The song’s musical content harkens back to the days of ‘Silent Lucidity’ or perhaps something off of Promised Land with its dual acoustic/electric approach. The song’s lyrical content set against that dual approach adds even more depth to the song with its seeming introspective feeling. That feeling is interpreted as LaTorre sings, “Reflections of time/They’re still yours and mine/The things that used to be/Remains so fine/Is the face of a child/Your calm embrace/You’re my shining star of the darkest nights/A saving grace/Seeing the signs of the times/Forever is now/There’s no rewind.” It’s definitely a stark contrast to the much deeper, more contemplative ‘Arrow of Time.’ Yes it seems somewhat schmaltzy considering that verse and the song’s other emotionally introspective verses. But when those verses are set against the song’s musical content, the song becomes far less schmaltzy and much more emotionally hard-hitting. Keeping that in mind, it proves why ‘Just Us’ is another example of why Queensryche remains so relevant and creative to this very day. It is not the last example either. ‘Guardian,’ the album’s second song, is one more example of what has kept Queensryche relevant for so many years. ‘Arrow of Time’ and ‘Just Us’ are both good examples in Queensryche’s new album of what has kept the kept such a relevant part of the rock and music community for so many years. They are just a couple of the songs featured in this record that can be cited as said examples. ‘Guardian’ is one more example of exactly that. ‘Guardian’ comes early in the album’s run. It is in fact the album’s second song. Long-time drummer Scott Rockenfield’s driving tempo serves as the song’s foundation. Wilton and Lundgren build on that foundation, strengthening the song even more. LaTorre tops off the recording’s musical side with his powerhouse vocal delivery. What is really worth noting here is the modern rock vibe generated through Wilton and Lundgren’s work. It is fitting that this is the case with this song considering the song’s lyrical content. The song’s lyrical content is especially relevant in a time of so much unrest. That is clear as La Torre sings, “Insurrection/This time we’re playing for keeps/Arming police like the military/It’s obscene/And they’re stalking the streets.” He goes on to sing in the chorus, “It’s time to rise up/United we stand/Divided we fall/Evolution calling.” Such content comes across as LaTorre commenting on the current state of the nation. The mention of police being armed like the military hits home because there are in fact police departments that have in fact received military caliber weaponry and vehicles. It was even a major news item for some time recently. There’s even a mention in the song about the political elite and other topics. It all comes across as a warning of sorts as to the direction that the country has taken socially and politically. The urgent, up-tempo feel of the song’s musical content couples with that seeming lyrical warning to make this song one that will definitely have listeners taking note. Considering all of this, it becomes clear why ‘Guardian’ is another important and impressive addition to Queensryche’s new album. It works with the other songs noted here and those not directly noted to make Condition Human an album that shows in whole why Queensryche is still just as relevant and creative both musically and lyrically as it was in its infancy more than three decades ago. All things considered Condition Human proves to be an album that is one more of this year’s best new rock offerings. This entry was posted in Celebrities, Concerts, Internet, Music and tagged celebrities, Century Media, Century Media Records, Eddie Jackson, entertainment, facebook, Geoff Tate, internet, Michael Wilton, music, Operation: Mindcrime, Parker Lundgren, Phils Picks, Queensryche, Scott Rockenfield, Todd LaTorre, Twitter, Wordpress by philspicks. Bookmark the permalink.